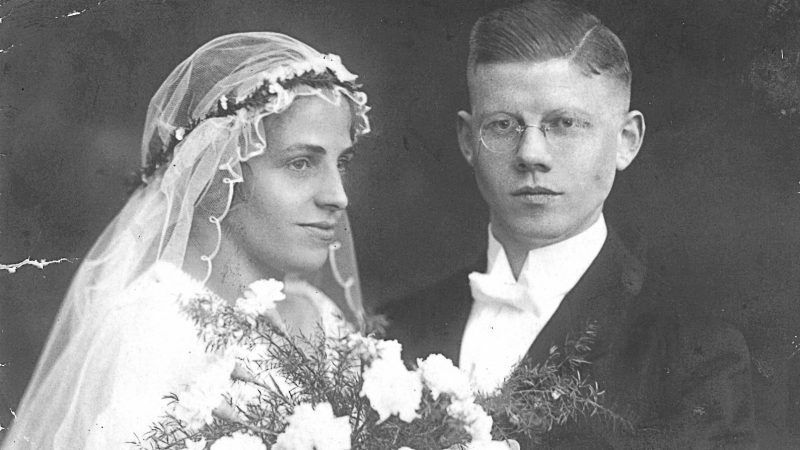 Géraldine Schwarz’s grandparents, Lydia and Karl Schwarz, at their wedding in the 1930s. Photo from the family's records. Géraldine Schwarz is a journalist, author and documentary-maker, with a French mother and a German father. She lives in Berlin, where EURACTIV France met her. In her book Les Amnésiques, published by Flammarion, Géraldine Schwarz gives a captivating insight into the past of her family of “Mitläufer”, bourgeois Germans who went along with Nazism, notably by taking over a business that belonged to a Jewish family in 1939. Written in French and also translated in German, with Dutch and Italian versions to follow, her book targets the European democracies tempted by the far right. Schwarz’s work will be given the 2018 European Book Prize by Antonio Tajani at the European Parliament on 5 December. Your book has just won the European Book Prize, is this a message against the rise of extremism in Europe? Yes, my book’s message is a deeply European one. This is because we cannot understand our existing democracies without doing substantial memorial work, which I have done by diving into the history of my French-German family. It is important to understand what happened to average citizens. Historians have mainly focused on the decision-makers, but for Europeans to feel involved, it is much more meaningful to recall normal citizens. Is the work to commemorate the Second World War carried out uniformly across Europe? Germany did this 30 years ago, France started 20 years ago, Italy is still in denial and the Netherlands – which handed over three-quarters of the Jews living in their country to the Nazis – still have not apologised. So, there are many different situations! The Germans initiated this memorial work on society. Being of both French and German nationality, I was able to both use this approach and to also take a different look, using the distance of dual nationality, looking at individuals and individual responsibilities. It is easier to identify with somebody like my grandfather, who went along as a “Mitläufer”, than with Himmler or Goebbels. This allows us to understand how an entire society can shift. Most of the population was not directly involved in criminal activity, but they supported a criminal enterprise: Nazism. Isn’t it difficult to look into a past that is potentially painful and complicated? I think it is actually a healthy thing to look at things as they are. My grandmother was fascinated by Hitler. She had not read Mein Kampf and did not know very much about the substance of his ideas but she thought that he was wonderful. This is a telling example of the way in which Nazism spoke to all levels of society and had something to offer to everybody. In order to manipulate public opinion, the Nazis were very much inspired by a work, La psychologie des foules (The Crowd: A Study of the Popular Mind) by Gustave Le Bon. It’s a major work that should be republished as a matter of urgency as it explains how individuals transform within masses. Certain processes described in this book can be found in the [German far right] AfD or the Austrian FPÖ [Freedom Party of Austria]: how to tell myths, how to make people dream or how to give an account that pleases everyone. What about in Eastern Europe? How do you explain the success of illiberal democracies in countries, such as Poland and Hungary? Our Western democracies were built in opposition to fascism, with Christian democrat parties taking a strong position on the matter. But in the East, the narrative imposed by the Soviets clouded the issue. There was an anti-fascist discourse but it lacked credibility because it was imposed by a totalitarian state. The result of which was an allergy to anti-fascism, which can be found in the AfD’s impressive scores in East Germany. So anti-fascism isn’t a shared value in Europe? We face a real issue in the lack of memorial work. In East Germany, the Soviet occupier’s position was to glorify the entire population by assimilating them with some communist resisters who had resisted Nazism. Even though in both the East and the West [of Germany], the majority of the country supported the regime. In certain former countries of the East, there are rehabilitated figures of fascism, such as in Croatia – and it is alarming to witness that. Of course, it takes time to build a democracy but the lack of knowledge of history or the refusal to acquire it are pitfalls. France has just had extensive commemorations for the First World War. Was that sufficient memorial work? The poor public debate was not a very good sign for democracy. When Emmanuel Macron mentioned the complexity surrounding Pétain, it was a subject that deserved much thought, but instead there was a sterile debate between people who think we are allowed to talk about it, and those who don’t want to, what a shame!